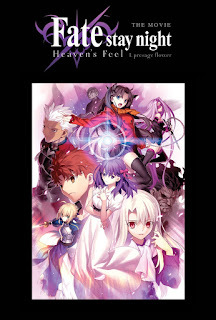 DENVER – April 24, 2018 – Two magical nights are in store for U.S. anime fans this June as the curtain goes up on the world premiere of the incredible English dub adventure, “Fate/stay night [Heaven’s Feel] THE MOVIE I.presage flower.” The latest installation of the beloved Fate/stay night series by TYPE-MOON is the first part of the “[Heaven’s Feel]” film trilogy. In addition to the feature, audiences will also view exclusive bonus content featuring English ADR Director Tony Oliver and the main voice actors. Tickets for "Fate/stay night [Heaven’s Feel] THE MOVIE I.presage flower” go on sale to the general public on Friday, May 4 at www.FathomEvents.com and participating box offices. Presented by Fathom Events and Aniplex of America, "Fate/stay night [Heaven’s Feel] THE MOVIE I.presage flower” debuts in U.S. cinemas on Tuesday, June 5 and Thursday, June 7 at 7:30 p.m. local time (both dates), through Fathom’s Digital Broadcast Network (DBN). A complete list of theater locations will be available May 4 on the Fathom Events website (theaters and participants are subject to change). Based on the wildly popular Fate franchise that gave anime fans “Fate/stay night [Unlimited Blade Works],” “Fate/Zero” and the hit mobile game “Fate/Grand Order,” the first film in this movie trilogy explodes with epic action and heart-wrenching drama, tied together by original author Kinoko Nasu’s unique storytelling and otherworldly cast of characters. For the first time ever, moviegoers will experience the film’s English dub along with the despair, romance and terrifying secrets of the Holy Grail War with protagonist Shirou Emiya in the first chapter of this high-stakes trilogy. The film summons the all-star English voice cast from “Fate/stay night [Unlimited Blade Works],” including Kari Wahlgren as Saber, Bryce Papenbrook as Shirou Emiya, Mela Lee as Rin Tohsaka, Kyle McCarley as Shinji Matou, Kaiji Tang as Archer, Crispin Freeman as Kirei Kotomine and Cristina Vee as heroine Sakura Matou. Composer Yuki Kajiura (“Puella Magi Madoka Magica,” “Sword Art Online”) will provide the soundtrack for the film, and director Tomonori Sudo (“the Garden of sinners -recalled out summer-”) returns to the Fate series to craft the events of the visual novel into the complete cinematic experience. Celebrated animation studio ufotable (“Fate/Zero,” “Fate/stay night [Unlimited Blade Works],” “the Garden of sinners”) returns to animate TYPE-MOON’s work, promising all of the dynamic action of the previous installations. 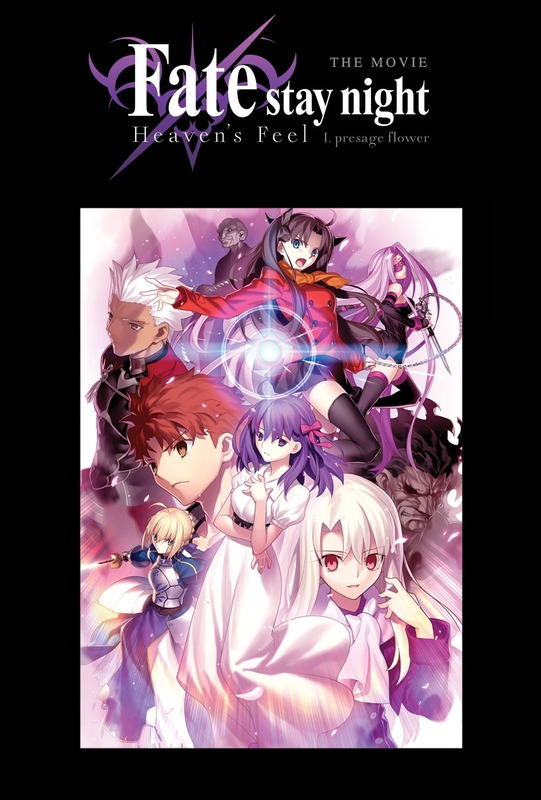 For artwork/photos related to "Fate/stay night [Heaven’s Feel] THE MOVIE I.presage flower,” visit the Fathom Events press site. Fathom Events is the leading event cinema distributor with participating theaters in all 100 of the top Designated Market Areas®, and ranks as one of the largest overall distributors of content to movie theaters. Owned by AMC Entertainment Inc. (NYSE: AMC), Cinemark Holdings, Inc. (NYSE: CNK) and Regal Entertainment Group (NYSE: RGC) (known collectively as AC JV, LLC), Fathom Events offers a variety of one-of-a-kind entertainment events in theaters such as live performances of the Metropolitan Opera, top stage productions including Newsies! The Broadway Musical and George Takei’s Allegiance, major sporting events such as Mayweather vs. McGregor, epic concerts with artists like Lady Antebellum and Sammy Hagar, the yearlong TCM Big Screen Classics series, inspirational events such as Is Genesis History? and IN OUR HANDS: The Battle for Jerusalem, and beloved anime titles like Princess Mononoke and Spirited Away. Fathom Events takes audiences behind the scenes for unique extras including audience Q&As, backstage footage and interviews with cast and crew, creating the ultimate VIP experience. Fathom Events’ live digital broadcast network (“DBN”) is the largest cinema broadcast network in North America, bringing live and pre-recorded events to 917 locations and 1,440 screens in 181 DMAs. For more information, visit www.fathomevents.com. Aniplex of America Inc. (Santa Monica, California) is a subsidiary of Aniplex Inc. (headquartered in Tokyo, Japan), a group of Sony Music Entertainment (Japan) Inc. and a leading provider of anime content and music production and distribution in Japan. Aniplex of America has launched fan-favorite Blu-ray and DVD releases including Fate/stay night [Unlimited Blade Works], Fate/Zero, the Sword Art Online series, Your lie in April, KILL la KILL, Bakemonogatari, Puella Magi Madoka Magica, Blue Exorcist, anohana -The Flower We Saw That Day-, NISEKOI, the OREIMO series, DURARARA! !×2, Magi series, Expelled From Paradise, The irregular at magic high school, and ALDNOAH.ZERO. The company's ever-growing line-up of shows include: March comes in like a lion, Blue Exorcist: Kyoto Saga, ERASED, The Asterisk War, OWARIMONOGATARI, KIZUMONOGATARI, Charlotte, Occultic;Nine, WWW.WAGNARIA! !, GRANBLUE FANTASY, Eromanga Sensei, Katsugeki TOUKEN RANBU, BLEND-S, Fate/stay night [Heaven’s Feel] I. presage flower, Slow Start, Record of Grancrest War, Today’s MENU for EMIYA Family, PERSONA5 the Animation, and Sword Art Online Alternative: Gun Gale Online. In June 2017, the company launched the English version of the popular mobile game, Fate/Grand Order, which has exceeded two million downloads.